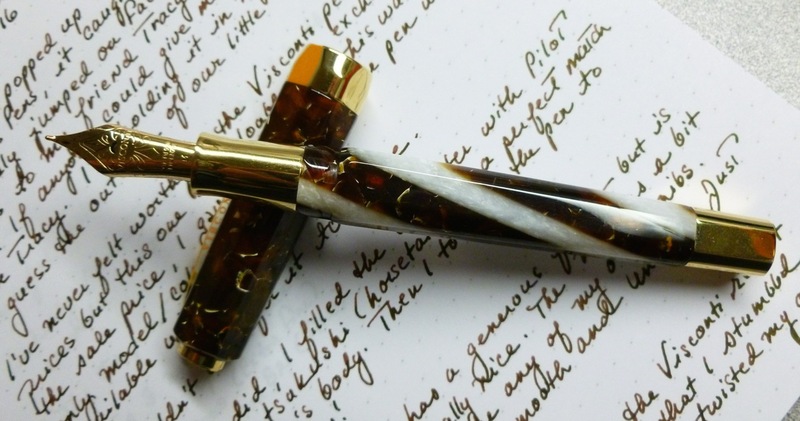 One day, a few months ago, THIS pen popped up on sale in an email from Fahrney’s Pens. I’ve admired the looks and reported performance of Visconti pens vicariously for quite some time, but figured it’d be a long time (if ever) before I acquired one. They do tend to be pricey. The sale on this pen, though, brought it into the range of the possible. But was the price really a good one? Was the pen a good one FOR the price? Hmmmm. What to do, what to do?! I quickly turned to someone who could help me sort out this pen dilemma— my friend and penpal, Tracy— known in pen circles as the Visconti Queen. 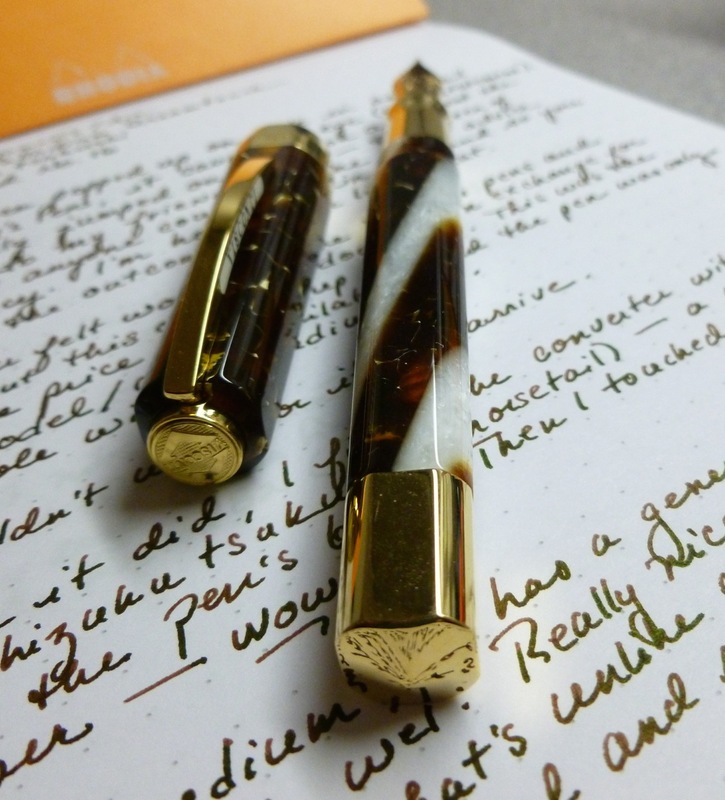 Tracy and I met for the first time at the 2013 DC Pen Show and the Viscontis in her pen case are drop-dead gorgeous. She’s a great ambassdor for the brand as she clearly knows her way around the Visconti block and is building a truly impressive collection. If anyone could help me, it’d be Tracy. And she did. We chatted via Facebook where she asked me about the particulars— the model, the nib, the price. After our chat she rendered her verdict— “Get it!” And so I did. I COULD NOT WAIT for it to arrive. 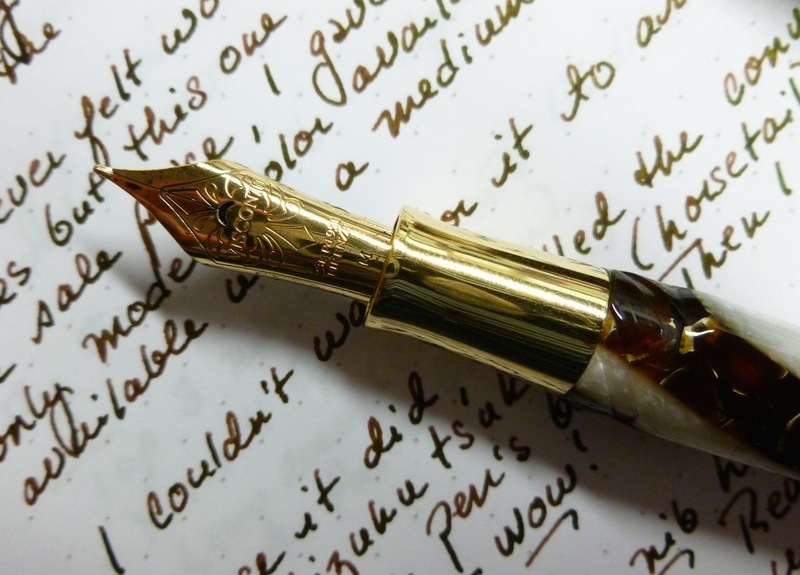 There’s always that underlying anxiety when I buy a pen online— will it live up to my expectations? Given the brand and the list price, my expectations were pretty high. Scratch that— they were REALLY high. 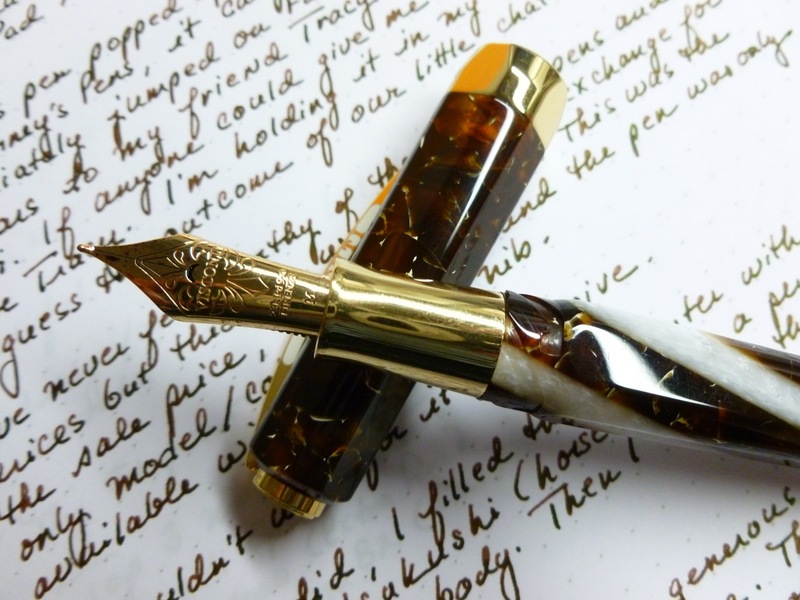 I think the resin is gorgeous— flecked and rich and just a LITTLE bit translucent, especially in the cap. So the lack of a model/color choice was not a problem. This Opera Elements pen comes with a “bayonet style” cap, which is neither screw-on nor a snap cap. Basically, you push the cap on, then twist a quarter turn so that the grooves in the cap engage with the grooves in the body. This style cap assures that the facets on the pen and the cap are always aligned. It makes capping and uncapping the pen quick and easy. 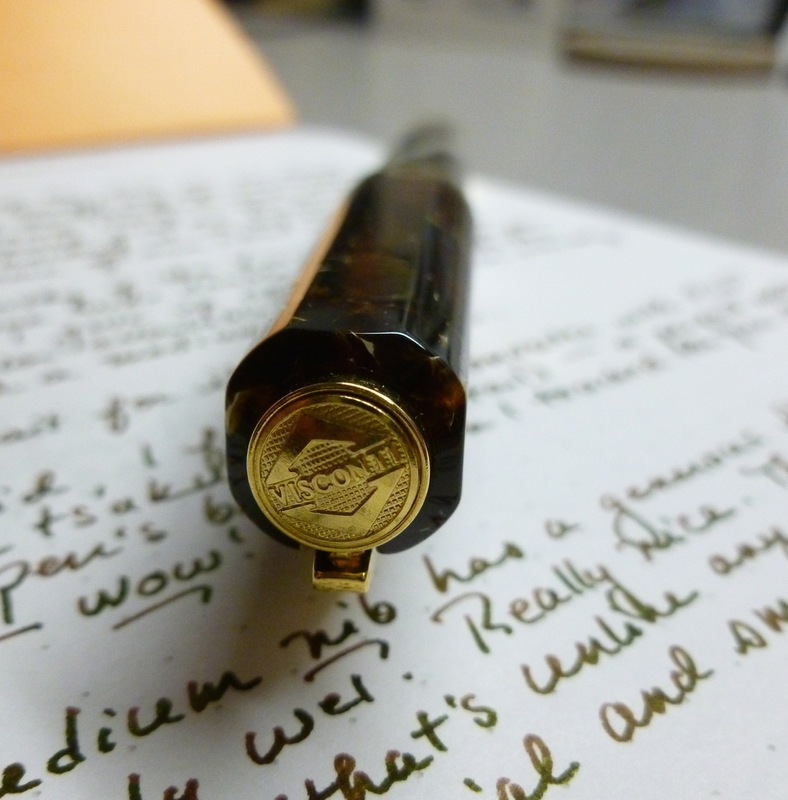 The cap can be posted, but I never do so because I’m afraid of scratching the metal trim, and because it makes the pen a little long for my taste. 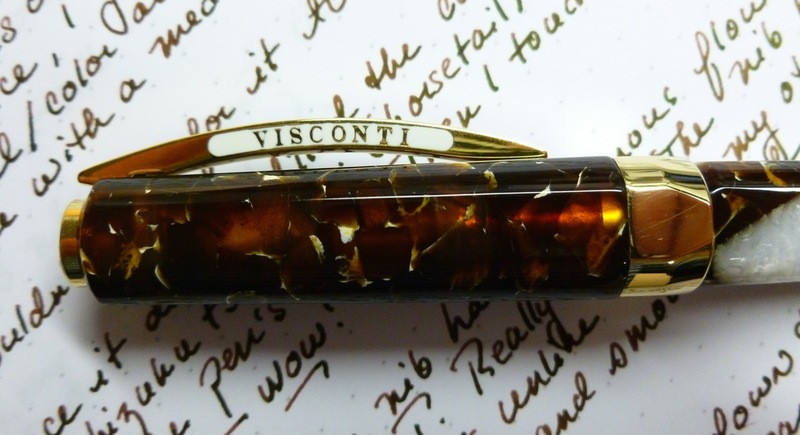 You can’t miss the iconic Visconti clip. It’s arched and springy and bears the brand’s name on both sides. I only clip this pen into my pen case, never into a pocket, so I can’t really attest to the functionality of the clip. It works fine for my application. After I admired the pen, and even the packaging (a leather-lined box with a built in drawer for holding the Visconti booklet), it was time to ink it up! I chose Pilot’s Iroshizuku tsukushi (horsetail) because the color is a dead-ringer for the Visconti Opera Element’s resin, and filled the converter. Then I got out a piece of Tomoe River paper and put the 23 kt PD950 palladium nib to work. Drumroll, please…. WELL, HELLO! They don’t call this a Dreamtouch nib for nothing. The springiness of the nib surprised me as it felt unlike any other nib in my collection. With just a light touch, the nib laid down a wonderfully wet line. I was worried that the medium nib might be a little too wide for my tastes, but it’s not. In fact, I think it’s one of the reasons I’ve been branching out into medium, broad, and stub nibs. The Dreamtouch nib— well, the whole pen, really— feels (and looks) elegant and makes me feel like I should be signing important documents with flourish. But of course, I’m not. I’m writing letters and doodling and recording the day’s joys and frustrations in my journal. Even my mundane scribblings feel elevated with this pen. The Visconti Opera Elements is now solidly at the top of my “best-writers” list, just above my Lamy 2000 and Delta Fusion 82. The nib, she is impressive. I think Tracy may be onto something.